TfL has belatedly re-discovered the benefits of full sized single deckers on busy routes, especially ones with physical restrictions that preclude double deckers. 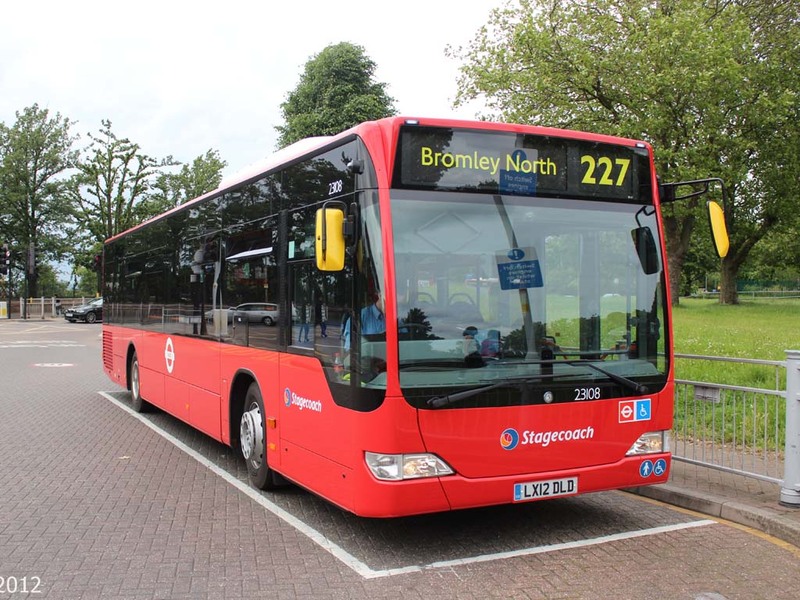 The 227, a short but frequent and busy link across south London, linking Bromley and Crystal Palace, is a case in point. The route passes under a low railway bridge at Shortlands, so it is not possible to use double deck vehicles. The latest buses on the route are Mercedes Citaros, and two shots are provided here. The first shows 23104 (LX12DKO) setting down at Market Square in Bromley on 23 June 2012, whilst the second image was captured at Crystal Palace Bus Station on the same day, which was the first day of operation. Apparently the route suffered two breakdowns on the first day, with Darts being brought in to substitute! In fact, the route has long been operated by large single deckers, although they have generally been a little short of the maximum permitted 12 metres. London Buses Leyland Nationals were replaced by Greenway converted LCBS examples (supported by a few Leyland Lynx) when Kentish Bus won the route in 1991. Closure of Dunton Green garage some years later and a drive for improved economy resulted in a switcharound of several routes between the Cowie and Stagecoach groups on 27 September 1997, though not before the 227 had won LT's "bus route of the year" competition three years in a row. Stagecoach gained the 227, which provided a convenient home for 12 Plaxton bodied Dennis Lances which had spent much of their lives rather unsuitably on busy route 208. 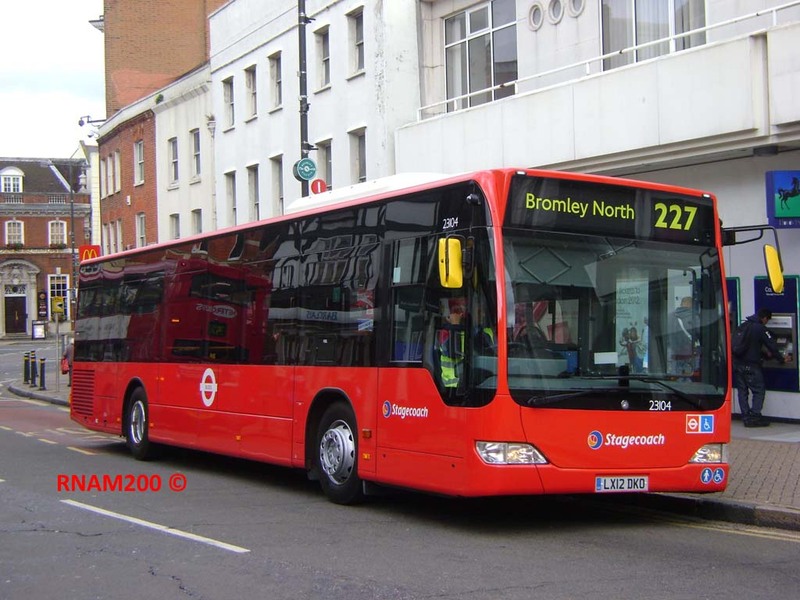 However, the search for low floor buses for a new contract commencing in June 2000 resulted in the purchase of 13 Super Pointer Darts – which are the only examples ever used on TfL work. Apart from being being as large as any National at 11.3m long, they have an upgraded driveline compared to the standard Dart, and could originally seat 38 in a dual door layout, though this was later reduced to 35 owing to TfL's antipathy towards tip-up seats. As conceived, the 227 ran between Penge (Crooked Billet) and Welling via Beckenham, Bromley, Chislehurst, Eltham and Welling Way. Urban development resulted in the Chislehurst – Welling section being replaced by new double deck routes 160 and 161 in May 1938. Extension to Crystal Palace came shortly after World War II, and the Bromley – Chislehurst section survived until shortly before the transfer to Kentish Bus, being replaced by a short-lived extension of the 161 to Bromley, and is now covered by the 162. 227 Bus – Dedicated website!